This is one of the many included dashboards to display various metrics, tables and charts. This dashboard features a simple-yet-stunning, 3-column responsive layout. With multiple dashboard layouts, you decide which one works best for your project. An alternate to the multi-level Sidebar, this layout works better to maximize horizontal screen real estate. Drag-and-drop items between vertical "swimlanes" with this Trello-style task board. A working app (AngularJs, React and Vue!) that loads JSON message data and includes "Compose" and "Message" views. A frequent use-case common to many Websites is displaying and filtering search results. Make the most of your responsive design with various reusable widgets. 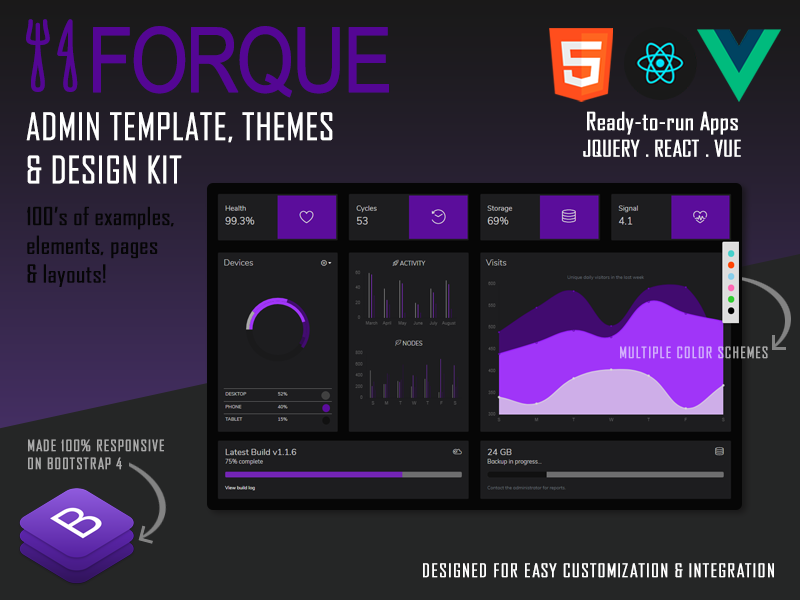 Have you seen all of Forque's beautiful light and dark themes? It's like getting 8 unique templates in one! CSS and customizable SASS are included. Included are multiple administration-focused dashboard layouts that exemplify metrics, call-outs, focused content areas, data tables and charting. Dashboards can be used for different focus areas such as sales, e-commerce, server or traffic analysis. Utilize Bootstrap's 25+ components, 100's of CSS styles and pre-made example widgets to kickstart your projects. Example pages are included for additional content such as Timeline, Gallery, Error (404 and 500), FAQ's and Pricing options. Just like Bootstrap, this theme has been crafted with care for design and performance. All built on modern HTML5 & CSS3 specifications to ensure responsiveness, consistency and cross-browser support. The templates maximize use of Bootstrap 4 without extensive additional CSS. This makes customization and integration easier. The code is also easier to migrate when a new release comes along. The path forward is clear and ready for continuous updates. Stay tuned for more upcoming features!